Get asked by lot’s of folks how the market is doing and I forget that if they are not active in looking for a home or thinking of selling/leasing that they might not realize what is going on in this wild and crazy real estate market we have been and continue to be in. Below is a good synopsis from The Real Estate Center . Check out the “available Inventory” for the DFW area! When I started the business in 1989 inventory was approx 9-12 months! 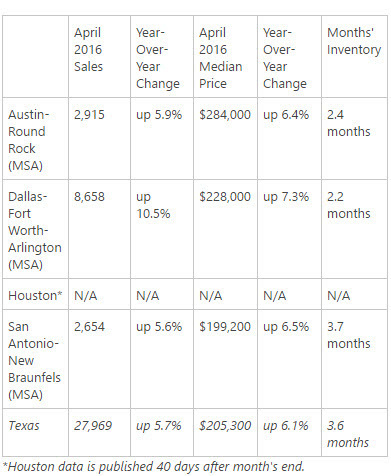 COLLEGE STATION (Real Estate Center) – Latest Texas home sales data show sales last month were up 5.7 percent from a year ago while the median price was up 6.1 percent. According to April 2016 data (as of 11 a.m. today), 27,969 homes were sold last month, about 1,500 more than a year ago and roughly 640 more than in March. The median price was $205,300 compared with $193,500 a year ago and $201,500 in March. Months’ inventory was at 3.6 months. Real Estate Center economists consider 6.5 months a balanced market. Here’s how the state’s major metropolitan statistical areas (MSAs) fared in April. April data for most Texas metros are available on the Center’s website.